"is my oven supposed to be on high broiling or low while i keep the 3-6 inches ... read full review"
Broiling and grilling are essentially the same technique: the application of intense, direct heat to the meat, one side at a time. In grilling, the heat is below the meat; in broiling the heat comes from above (usually in an oven). 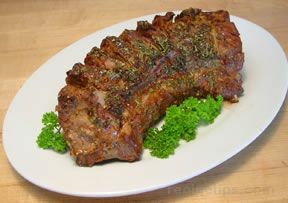 Meat for broiling should be tender, fairly lean, and not too thick, since it cooks quickly. 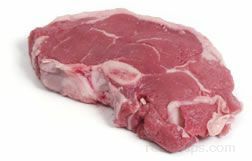 Lamb cuts that are good choices for broiling include chops, tenderloin slices, kebabs, and patties of ground lamb. 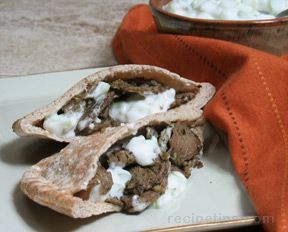 In order to properly broil cuts of lamb, it is important to use the correct temperature. The distance the lamb is placed from the heat source is an important factor for determining this, just as it is when lamb is grilled. The temperature is adjusted by changing the distance between the meat and the heat source. 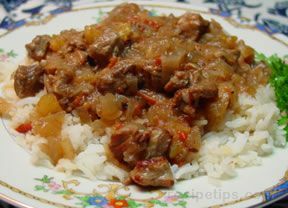 Thinner cuts of lamb can be placed closer to the heat source than thicker cuts, since the thicker cut will require more time to cook. If the thicker cut is too close to the heat source, the surface will char before the interior is cooked to the proper degree of doneness. Placing thicker cuts farther from the heat source allows the meat to cook thoroughly without burning the surface. The goal is to produce lamb with a brown, crusty surface and an interior that is juicy and tender. 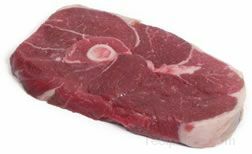 Before broiling cuts of lamb, it is beneficial to remove the meat from refrigeration for a few minutes to warm it slightly, however the meat should not be allowed to remain at room temperature for an extended period. 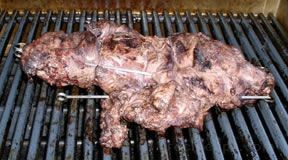 It may be difficult to broil well-chilled lamb cuts properly if the meat is placed immediately into the broiler from the refrigerator. 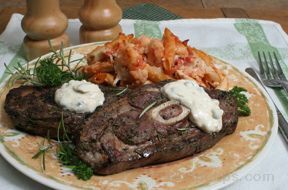 It is possible that the outer portion of the meat may be fully cooked and begin to char before the interior portion reaches the proper doneness. 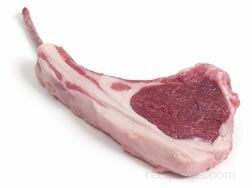 For thinner cuts, such as lamb chops, it is best to trim most of the border fat allowing ¼-inch of the fat to remain. This will help to prevent excess spattering and smoking during the broiling process. When lamb is broiled, it is placed on a broiling pan. The broiling pan catches melting fat and juices that drip from the meat as it cooks so that the oven stays cleaner. It also prevents the fat from starting an oven fire. Oven racks should be adjusted to allow for the height of the broiler pan and the thickness of the meat, which should be about 3 to 6 inches from the heat source. The broiler oven should be preheated at the highest temperature setting for 10 to 15 minutes. The broiler pan should be preheated under the broiler for several minutes before the meat is placed on it. 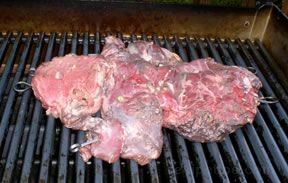 Lamb cuts should be brushed with oil before they are placed on the broiler pan to prevent sticking when they are cooked. 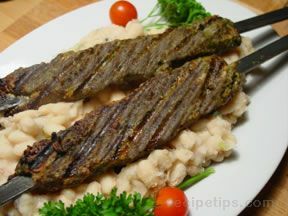 Meat that has been marinated in any mixture containing oil can be placed on the pan without additional oiling. 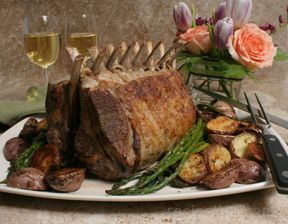 It is often beneficial to coat lamb pieces with various ingredients (mustard, herb rubs, or pastes) to create a crispy crust when broiled, which also seals in juices and tenderness. 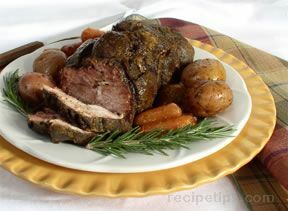 When broiling lamb, the meat is usually cooked on one side, turned once, and cooked on the other side. When turning the meat, a tongs should be used to avoid puncturing the meat and allowing juices to escape. The meat should be watched closely to ensure that it does not become charred and burned. For pieces that are thicker than one inch, the meat can be seared on both sides under the broiler, but additional cooking at a lower temperature is necessary to ensure that the meat is cooked to the proper doneness. well when grilling, but the cooking times may vary. 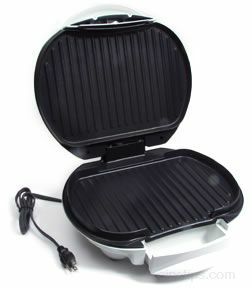 Pan-broiling is a useful variation of oven broiling in which the surface of the hot pan becomes the heat source. It doesn't require heating up the oven and allows for easier monitoring of the cooking process. Pan-broiling works especially well for chops and patties. 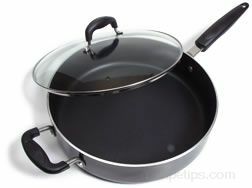 Heat a heavy bottomed pan until it's hot enough to evaporate a drop of water instantly. Sprinkle a little salt over the surface of the pan. This helps make a tasty crust on the meat and doesn't add a significant amount of salt to the food. (You can omit this step and still get good results). The lamb should sizzle as soon as it is placed into the pan. The meat should be browned well on one side and then turned to brown the other side. When turning the meat, a tongs or spatula should be used to avoid puncturing the meat, allowing juices to escape. If the meat requires longer cooking at this point, reduce the heat somewhat to prevent burning. If the meat will not be served immediately, cover the pan to hold in moisture. "is my oven supposed to be on high broiling or low while i keep the 3-6 inches away from the top. its my first time using the oven rather then pan and I'm very open with cooking ideas yet very cook sensitive with my food, i try to do everything perfect even if it means longer, however lamb chops cannot take a longer period of time..like steak, (hence my husband cooks all of our steaks on the grill) . Just wondering about temperature of the broiler. Thanks!!" "Obviously written by a man. Strait to the point, well written and a great recipe. Thank you ..................."